Vanessa Link and Clark Matthews don’t want your pity, and they don’t care if you think they sound a little harsh when making their points. 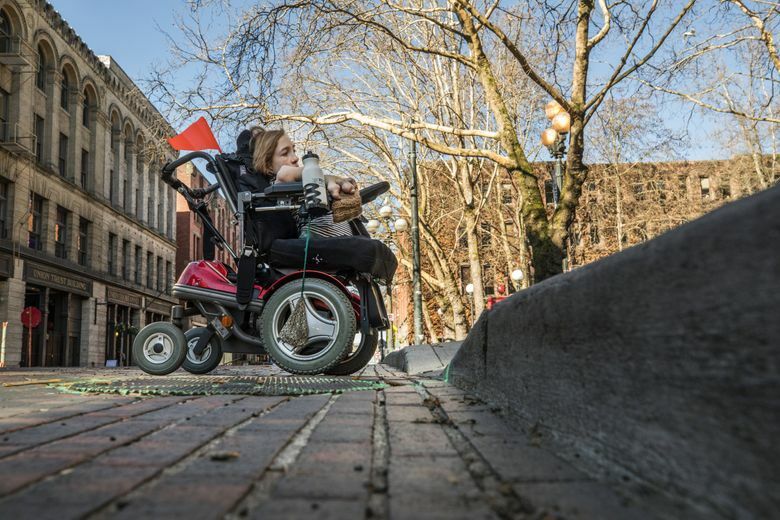 Earlier this year, as the Washington state Legislature considered a bill that would allow Seattle to use traffic cameras to enforce bus-only lanes and crosswalks, Link and Matthews starred in a viral social media video to demonstrate the impact blocking intersections has on their ability to get around the city in a wheelchair. “We’re both tired of these [BLEEP] cars blocking the [BLEEP] intersections,” Link said in the video. Lawmakers failed to pass that bill, HB 1793, but a compromise effort that would attach it to the state budget bill, with half the ticket money going to the state, has renewed its chances. 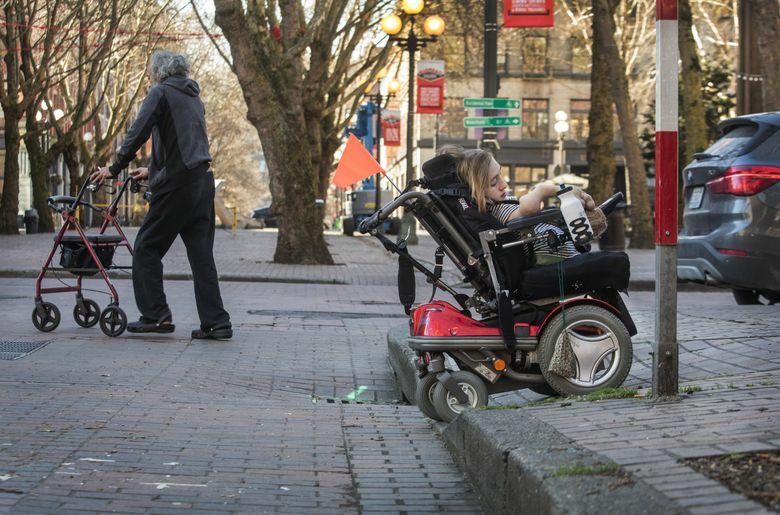 And Link and Matthews, who work at the disability rights advocacy group Rooted In Rights, have continued to advocate for an accessible city for all people in Seattle. In Traffic Lab’s second Ask An Expert Q & A, we spoke with Link and Matthews about their experiences navigating the city by wheelchair. Link uses an electric-powered wheelchair, and Matthews uses a manual wheelchair. Do you know of any experts you think we should feature in one of our Q&As? Nominate them here. Vanessa Link: In Seattle, I try to use light rail as much as I can. I really like the light rail because it’s flat and smooth, and I can be fully independent that way. I can just drive on, and I don’t need to be strapped down. I really like that I don’t need to depend on anyone else to help me. Clark Matthews: I’m multimodal aside from bicycles. I drive. I take the light rail every day to work. I take buses and streetcars. I’ve taken a ferry. My preferred way is to be able to push myself and not have to worry about [driving and] finding a parking spot. There’s more flexibility when I can get around on my own. Q. Which areas in Seattle do you find the most difficult to navigate? VL: Areas of the city that are older and haven’t been renovated tend to be more difficult access-wise. They tend to have sidewalks that have a lot of cracks and are uneven. They can be steep and have steep curb ramps. Buildings may not have elevators. Those issues may seem little to able-bodied people, but it’s a big deal to people in wheelchairs. Q. How does Seattle compare to other cities in terms of accessibility? CM: Seattle has a much newer transit system. Light rail is still being built out. I have found that it’s great to live where every train station is above ground and fully accessible. On the East Coast, like in Philadelphia, infrastructure is older. Looking at the transit map, I don’t have to search which places do and don’t have access symbols by them because they’re already there. There is a natural barrier created by the slope of hills in some areas in Seattle, like downtown. All too often, the way people get by is by not getting around at all. Q. Do you feel included in the definition of pedestrians? VL: It goes unspoken, the exclusion. It’s not said outright. When I hear “pedestrians,” because I use a wheelchair I include myself in that definition, but I don’t think other people do. Q. How do you think transportation design and engineering fail to account for people with disabilities? VL: It can take me longer to cross the street than people walking. Sometimes people in wheelchairs have to back down in a curb ramp. That means I have to take the time to turn my wheelchair around backward, slowly back up while looking behind me, and then get to the bottom, and turn back around to a front-facing direction, and then cross the street. CM: I used to see passengers rolling their eyes and huffing when the bus driver would roll out the lift and help strap me on, since I was adding minutes to the stop. It felt really cruddy that everyone acted like I was the one causing the problem when it’s really a system problem. Every time you go out, people you encounter treat you like a burden. That has a huge impact on quality of life. Q. How do you respond when lawmakers cut funds for accessibility because they say they need to prioritize other issues first? CM: People act as though there are only a small number of folks with disabilities and use that argument to make the case against accessibility. But the simple truth is that things designed to be accessible for everyone are accessible for everyone — people with walkers, with strollers, with luggage all benefit from infrastructure designed for people with disabilities. What can be framed as helping just a small number of people is actually uplifting everybody. Q. In a video you both starred in that showed the impacts of blocking crosswalks, you used strong language to emphasize your point. Was that intentional? VL: Yes, it was very intentional. We did it to lessen the stigma around disability and the myth that we’re either sad and pitiable or sweet and cute and childlike. We’re human. We’re people. We have emotions about this. Don’t feel sorry for us. Don’t pity us. Just don’t block the intersections. That was the message we were trying to put out there. CM: Folks with disabilities aren’t always given autonomy and people think we’re being used as puppets. It was important for us to show we make our own decisions. If we’re snarky about it, people know it’s going to be coming from us. We were real and authentic. Q. What do you think people don’t understand about people with disabilities? VL: People have very low standards for what disabled people can accomplish and do in life. So they congratulate us for doing the very bare minimum because they don’t think we can do more than that. So doing anything is an accomplishment and that sets the standards really low. I’ve been congratulated for crossing the street, and going up a curb ramp, and getting on the bus, and hanging out with my friends. Q. Are there things the city can do to make getting around more accessible? CM: Having one integrated system is always a better way of doing things. Adjusting signal timing and giving pedestrians enough time to get across [the street] can help. Plenty of people struggle to make it to one corner or the other before the light goes red. In building light rail, we have a great opportunity to make sure we do it right. For example, don’t build just one elevator. Built at least two, so if one gets stuck, we have another way to get down to the platform. We need to set the standard that everyone should be able to access our communities now or we’re not going to do it. In the end, that’s going to make us design a better transit system. 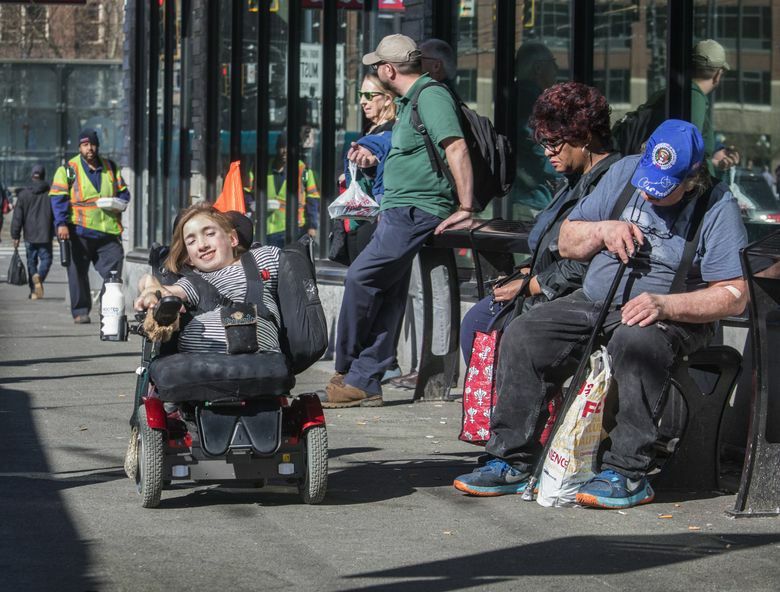 If you’re a person with a disability and you’d like to share your experiences navigating Seattle’s transportation system, please email mbaruchman@seattletimes.com. Michelle Baruchman: 206-652-6588 or mbaruchman@seattletimes.com; on Twitter: @mlbaruchman.